During my recent visit to Lichfield, I missed an opportunity for a return visit to Comberford village. Now I have read a sad report, published in the Tamworth Herald earlier this month that talks about the distress local residents are feeling about the state of the church in Comberford, which was closed at the end of 2013. 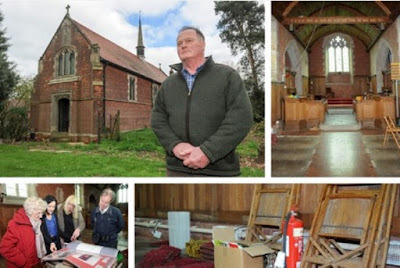 In a report headed ‘Tamworth family furious after they claim diocese left church ‘gutted’,’ Jordan Coussins reports how a heartbroken family have spoken of their disgust after the church in Comberford was gutted of its artefacts by the local diocese. 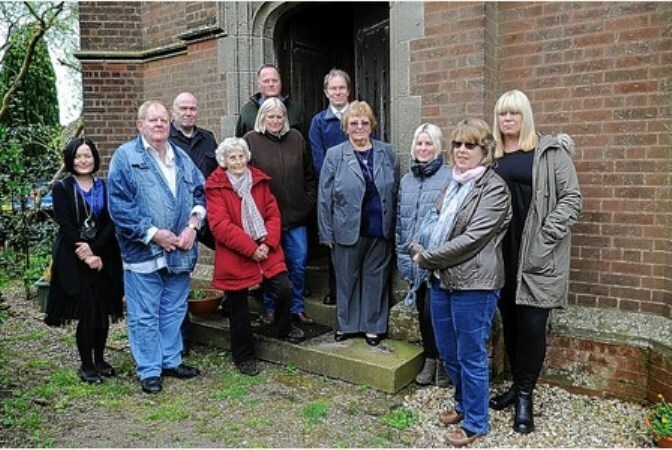 The church, which stands in Manor Lane, has been locked in a legal battle of ownership for almost four years since it was closed by the Diocese of Lichfield and the Paget family now claims that the diocese tried to sell the church. 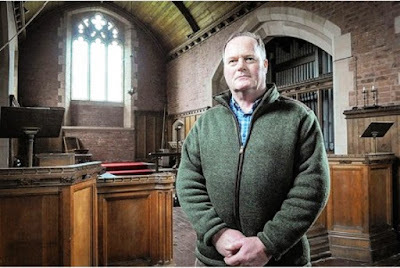 Charles Hodgetts, who is a direct descendent of Francis Paget, a former owner of the church site, has called the situation ‘disgusting’ and has vowed to continue the fight for justice. ‘It’s tragic,’ he told the Tamworth Herald. ‘It’s complete vandalism what they have done to it. They have just ripped out items that were gifted by the Paget family. ‘These things should never have been taken from here – the church has been left like a building site. ‘There is loose wiring everywhere. They have reduced a once beautiful church into nothing. The church was originally donated to a Lichfield Diocesan Trust for the people of Comberford by the Paget family who lived at Elford Hall. The first stone was laid at a special ceremony in 1914 and the building was completed in 1915. Joanne Cliffe, who is an active member of the Friends of Comberford Church, has vowed to give the church back to the people. 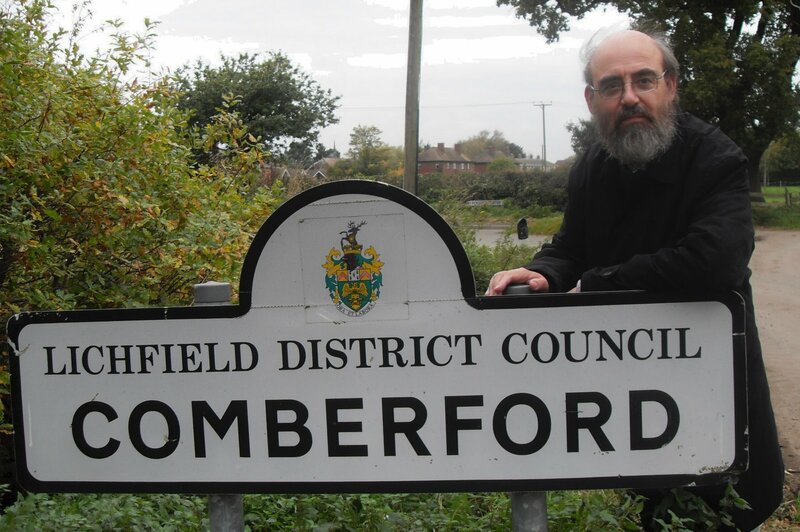 For many generations, my family continued to regard Comberford as our ancestral home, despite some of the complicated details in the family tree. My great-grandfather, James Comerford, had a very interesting visit to Comberford and Tamworth at the end of the 19th or in the early 20th century, visiting the Peel family who lived there … he probably had his heart set on consolidating those family links. I first visited Comberford and Comberford Hall in 1970 and have been back many times since then. I have written before how – when my mind and imagination go wild – I think of how nice it would be to buy back Comberford Hall, and even dream of using that grand old house as a retreat centre or as a centre for spirituality and the arts, with the village church close at hand, across the fields at the end of a public right-of-way footpath. But the closure of the church can be the harbinger of the death of a village … and the church should be the last place to condemn a village to death. Comberford village, in Lichfield Rural District, is two or three miles north of Tamworth and about four or five miles east of Lichfield … as the crow flies. The village is without either a post office or a pub, and in recent years the village church closed, having been at the heart of the village for over a century, is closing. It is a description of a church that would have appealed to many members of the Comberford family in previous centuries. However, they would have worshipped in Saint Editha’s Church in Tamworth, where generations of the family are buried in the Comberford Chapel ... although the original Comberford Hall may also have been used for Roman Catholic Masses in the late 16th century and for Quaker meetings for a short time in the mid-17th century. The church in Comberford was built on a site donated in May 1914 by Howard Francis Paget (1858-1935) of Elford Hall to the Lichfield Diocesan Trust for the erection of a mission church. Howard Paget’s father, the Revd Francis Edward Paget (1806-1882), was Rector of Elford, an early follower of the Oxford Movement, and the author of Tractarian fiction, including The Curate of Cumberworth (sic) (1859). The Paget family’s interest in the area continued for generations. Howard Paget’s daughter, Charlotte Gabrielle Howard Paget, married Joseph Harold Hodgetts, and died in Lichfield in 1979. Their son, the late Harold Patrick Hodgetts, lived nearby at Model Farm in Elford, and Pat Hodgetts was proud that his grandparents had given the church to the village. The church is of architectural interest as one of the churches designed by Andrew Capper. A well-known Gothic revival architect, he worked closely with George Edmund Street. 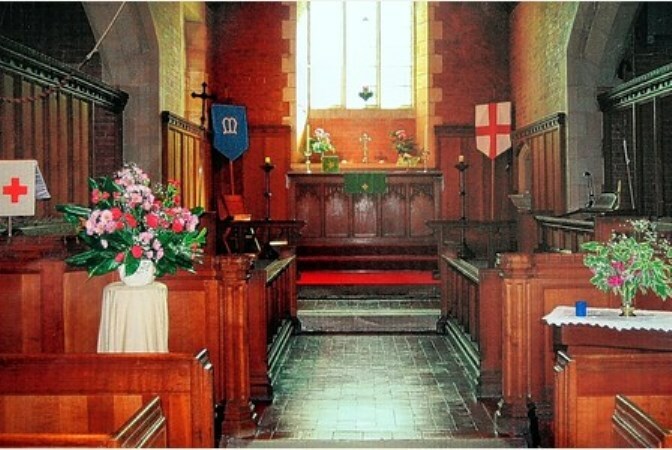 He designed, refurbished or contributed to rebuilding other churches in the Diocese of Lichfield, including Saint Leonard’s Church, Dunston, South Staffordshire; Saint Cuthbert’s, Donington, a Grade II Listed Building; and, I think, Saint Mary’s, Dunstall. 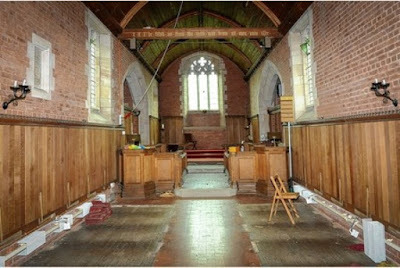 His work alone makes the village church in Comberford of interest to architectural and heritage groups. The closure of the post office or the local pub is a bitter blow to a village. But if the village church stays open against all the odds, then it is a living testimony to our faith in the villagers and to our faith in the Resurrection, affirming the people who live there and asserting that their value is not to be assessed in merely fiscal terms or by counting the financial contributions they make to the life of the wider Church. Some estimates say about 20 Church of England church buildings are closed for worship each year, and the church in Comberford joined that list in 2013. Saint Mary’s and Saint George’s Church is on Manor Lane, but the parish does not own the surrounding land, and access to the church is along a public right of way. But still this church has been the focus and point of contact in Comberford village for years. The attractive interior decoration and the rounded ceiling – both in wood – helped to created a sense of peace and tranquility. There is a truism that we do not inherit what we have from the past but hold it in trust for the future. The future for the church in Comberford may be something very different than we can imagine. It would be sad to see it become another private house in the village. It still seems to me that its location offers the potential for a retreat centre or a centre for the arts and spirituality. The expansion of Tamworth may open potential for future generations. Who knows? 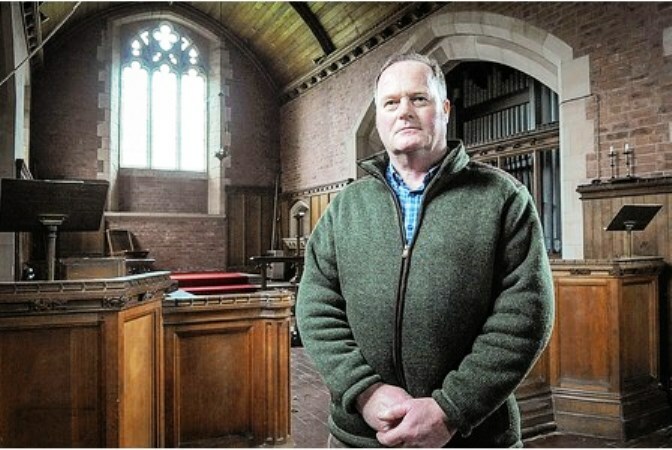 Despite the report in the Tamworth Herald earlier this month, I hope that with a little imagination this church this church can remain a great resource for local people and a centre for the community for generations to come.